Rock springs gushes at a rapid speed out of a cleft in a rock outcropping (see photo below), creating a natural ‘lazy river’, which takes 20-30 minutes to float down on an inner-tube. The rock formations that continue, especially at the beginning, are quite striking and beautiful compared to scenery I’m used to seeing in the greater Orlando area. Rock Springs Outcropping at Kelly Park in Orange County, Florida. Horseman SW-612, 35mm Rodenstock Apo-Grandagon. F11, 4s, ISO 100. Kodak TMAX100, TMAX Developer. Schneider #3C Center ND. Photo by Richard Auger. The moving stream begins to slow down into a snaking meander. Below, large rocks create a small obstacle course in the beginning of the 3/4 mile stretch to the end. Rock Springs meander at Kelly Park in Orange County, Florida. Horseman SW-612, 35mm Rodenstock Apo-Grandagon. f11, 4s, iso100. Kodak TMAX100, TMAX Dev. Schneider #3C Center ND. Photo by Richard Auger. Eventually, the stream arrives at the main swimming hole. Within Kelly Park’s access, the river finishes at a series of boardwalks exits. The ‘lazy river’ swimming area ends at a bridge that connects the trails. The stream can be seen continuing on from the small bridge at the end, with a large opening between the trees. Rock Springs Landing at Kelly Park in Orange County, Florida. Horseman SW-612, 35mm Rodenstock Apo-Grandagon. f11, 2s, iso100. Kodak TMAX100, TMAX Dev. Schneider #3C Center ND. Photo by Richard Auger. My trip to Kelly Park had mixed feelings. The clean and clear water, unique rock formations, and lush green foliage were a great experience, but the park was overcrowded, and I needed to wait at least 10 minutes for a mob of people to clear out to take each shot (on a weekday, no less). Concrete seawalls encase the swimming holes so that people don’t get there feet dirty, just like at Wekiva Springs. Concrete walls are one of my biggest pet peeves about Orlando swimming holes. There is nothing more sacrilegious you can do to a natural wonder (besides dumping and bouldozing). Further, paved sidewalks followed in parallel to the river for easy entrance/exit, and dozens of acres of land were plowed over for building of outdoor pavilions. It all just seemed unnecessarily intrusive on such a pristine and special river. Do people really need all this construction to enjoy nature? Scroll below to see some additional photos of Kelly Park. Boardwalk toward the end of Rock Springs. Mamiya 7ii, 43mm f/4.5. Ilford SFX200, Ilford DDX. B+W Infrared 092. Photo by Richard Auger. A meander after the outcropping. One of many bridges can be seen in the back. Mamiya 7ii, 43mm f/4.5. Ilford PanF 50, Ilford DDX. Hoya X1 HMC green filter. Photo by Richard Auger. Water flows over large rocks at Rock Springs, Kelly Park, Orange County, Florida. One of many bridges can be seen in the back. Mamiya 7ii, 43mm f/4.5. Ilford PanF 50, Ilford DDX. Hoya X1 HMC green filter. Photo by Richard Auger. Sorry I didn’t get into this until I emailed you. But thought of another photo shoot for you. “The killing of a river”, here in Winter Park. It is unused to the point of having No Name. Thanks Vince for the comment and email. Which river in Winter Park are you referring to? (( Going past Ft Maitland – I’ll have to tell you about the damb ))to a small lake called Lake Wampee then into Lake Howell. With another damb then on thru Seminol county. Fro their I don’t know what lake it goes thru. Wonderful B&W of Rock Springs!! I feel your pain with all the concrete. I have been swimming at Rock Springs and Wekiwa springs for 35+ years. Most of all that concrete was done when those were privately owned. I do remember when none of the board walks existed at Rock Springs. I remember showing up one weekend and all of a sudden there they were, that was about 1989-1990. I have stayed away for years due to the crowds and then I took my daughter there a few weeks ago. By noon we were ran out by the crowds. The river was loaded from end to end with tubes. It was never ever like that before. Anyways I live exactly 3/4 mile form there and plan on going in the winter, during the week when the only people that are there are a few campers. 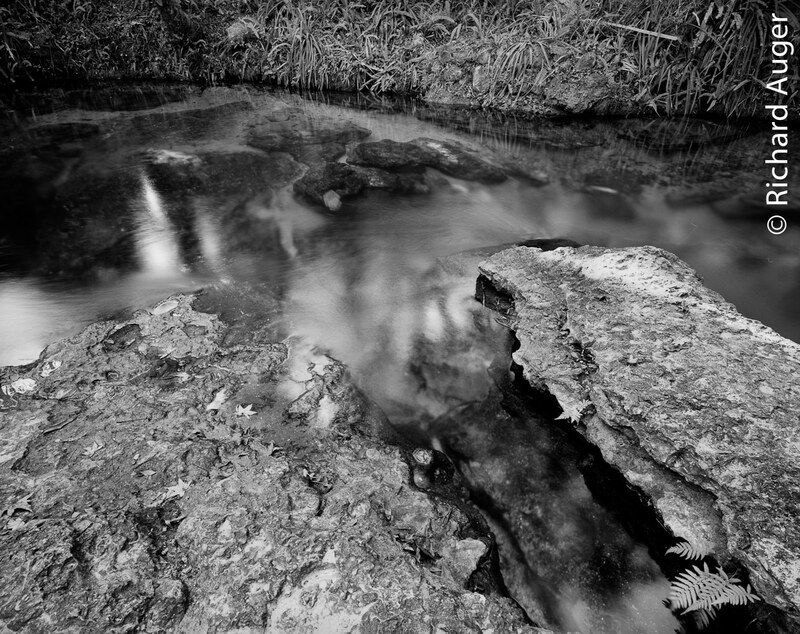 There is a more natural spring area not far from Wekiwa springs. It is a private subdivision called The Springs. It located at Wekiva Springs rd and 434. If you can get in touch with the HOA or know someone you can get in. There are some older unmaintained spring pools that have been in use since late 1800’s. Thanks Shane! Hopefully the park will take the walls down one day. I recently was at a spring head in north Florida where the park service had taken out the concrete and replanted the original habitat to let it return to its natural state. I’ve found that spring heads are especially difficult to shoot, because they are so trampled or have a close manmade structure that spoils the feeling of seclusion I want in my photographs. I generally go on a max of 4-5 day trips when shooting so that I can avoid the weekends. But I still find signs of people everywhere; I once picked up enough trash in a river to fill large kitchen trash bags. And I keep seeing more and more new home contruction on the border of parks, rivers, and wildlife sanctuaries. I may check out The Springs one of these days; stay tuned! Richard: Are you talking about them taking out the guard off fenceing in front of the cave ? I was in the cave before that went up and it would be VERY unsafe should people go into the cave. Many parts of the floor have broken threw and a person could REALLY get hurt or stuck and die. Hey Vince! The safety feature of the bars is a good idea, especially with so many kids there. I was more talking about the seawalls in large open center along the river, which I don’t have any pictures of here. Maybe the walls serve a purpose that I’m not aware of, but like Wekiva springs, I believe they are for people to more easily enter, exit, and jump in.